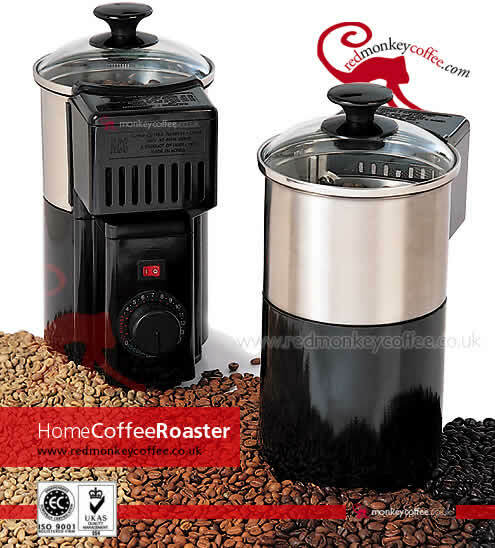 Red Monkey Coffee UK - Green Beans Home Coffee Roasters Green Bean Coffee Home Roasters UK - Red Monkey Coffee UK. Roast your own coffee at home with this green bean roaster. 16/2/06 - OUT OF STOCK UNTIL FURTHER NOTICE - Email to be notified when in stock. Ground coffee stays fresh for only a few days, roasted coffee beans are only at their most fresh for a week or two, green beans maintain freshness for 1-2 years. With a home roasting setup you can make sure your coffee is a fresh as possible by roasting it as you use it. This machine allows you to roast raw green coffee beans in your own home, the ultimate in coffee freshness and choice. Using fresh green beans, which retain their quality for up to two years, our roaster allows you to achieve coffee perfection in less than 15 minutes! The Home Coffee Roaster has a tempered glass top that allows easy visibility, giving you complete control of the roast. The roasting chamber is made of stainless steel and it is convenient to wash. The chaff collector is very effective and easily removed and cleaned. Simply pour the green beans available from Red Monkey Coffee.Com into the tempered glass roasting pot, set the roasting timer, relax and enjoy the intoxicating aroma. The beans will be roasted, then leave to cool and they are then immediately ready to be ground to suit your coffee maker. Excite your palette - experiment with Red Monkey's coffees from around the world and roast fresh green beans to light, medium or dark espresso - whenever you please! Fluid air coffee roaster. This roaster works by super-heated air convection which roasts the coffee evenly and quickly. The beans tumble around due to air turbulence resulting in every side of the bean being roasted by the super heated air.  Set and forget timer or manual override.  Hot air roasting produces a consistent roast, time after time.